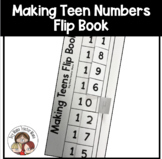 Making Teen Numbers File Folder Match and Fill-In: Super Hero Themed! 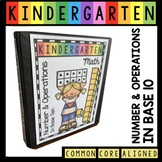 Print and laminate the ten frame cards. 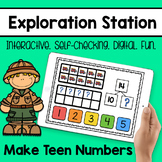 Students can use the ten frames to make the teen numbers. Then record the numbers in the recording sheet. Student practice making the teen numbers (11-19) using their 10+ facts. Dance Around the Tens! 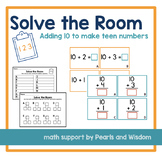 Making teen numbers with groups of 10. 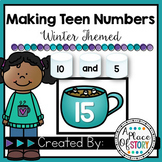 Students practice identifying and making teen numbers by putting snowballs on a double ten frame to match the number on the teen number card. Ten Plus! 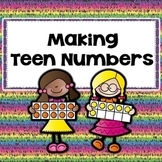 Making teen numbers from 10 and identifying the pattern! 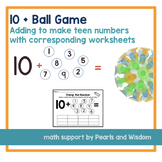 This is a quick worksheet that allows students to practice adding on to 10. It also gives them a space to write about the pattern they notice in the answers. 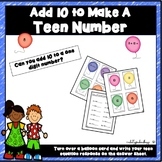 Add to 10 to Make a Teen Number - FREEBIE! 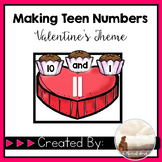 Who Can Make Teen Numbers? 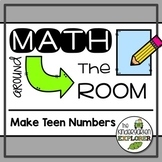 Two worksheets to have students make teen numbers by coloring the tens and ones cubes.